Announcer: [0:02] You’re listening to the OverDivorce.com podcast with hosts Tom and Adrian, two guys swapping stories about getting over divorce. If you’re going through a painful divorce, and are struggling with anger and anxiety, you’ve found the right podcast. Hang with us for the next 30 minutes, or so, and we promise, you’ll gain useful insight and effective tips for getting over your divorce, and rebuilding a better life. Tom: [0:26] Hi again. Welcome to the podcast. My name is Tom. Adrian: [0:28] And I’m Adrian. Tom: [0:29] Today, on the agenda we’ve got kids. Typically, this is the thing that you’ll hear the most about, mandatory instruction from the state about how to co-parent. Different states have different materials, but typically the state is the most concerned with the well-being of the kids. All the decisions in your divorce are really rooted in doing what’s best for the kids. There’s lots of advice and instruction about how to deal with that. [1:00] I think, today we’re going to try to talk about some things that may not be so obvious in those materials that get shoved down your throat, the rationale behind that. Some stories about our own kids, and what we face going through them, and some of the insidious things that happen when kids are involved. The mistakes are easily made, just because they’re not super obvious, unless someone tells you it’s going to happen. The main thing, Adrian, is getting started around that idea of what to communicate to the kids when that break-up is going to happen. Adrian: [1:34] For me, that was the hardest, when it become apparent, and that was real and there was no going back that had to communicate with my boys now that their parents were splitting up and that things were changing drastically. I’m lucky in the fact that my ex and I were both on the same page in terms of really being aware of being careful with the kids, and making sure that we were both communicating with them effectively, and weren’t using them as weapons in the break up. [2:13] When it came down to tell them, it really happened in steps, because as my ex and I split up, it was over time. There was a separation phase, a time that she had moved out, and so we kind of eased into it. I think that was helpful to the kids seeing this change go a little bit, it wasn’t as abrupt. Coming down and telling them that this change was happening was hard. Tom: [2:42] It’s interesting because you mentioned the importance of not using them as a weapon, and I was immediately struck by what’s more insidious, as I mentioned at the top of this, is that idea of them being communication conduits. I reflect on my experience of my wife leaving and taking my child with her, and I was devastated by it, and I didn’t see it coming. I maintained concern and dealt deep emotional connections to her, my wife, and, of course, my child. [3:21] I found myself asking my teenage kid, “Hey, how’s your mom doing?” Reflecting on it and going, “You can’t really even do that.” As benign as that question might be, it’s still inappropriate. Kids don’t want to talk about this stuff, and honestly, they shouldn’t have to because this is between their parents, and it shouldn’t involve them, really, in any way in terms of communicating between the two parties. [4:19] It was interesting, because I didn’t realize it at the time, but my wife was using my kid as a buffer so that she wouldn’t have to necessarily talk to me on the phone. Fast forward, I realized that, yeah, any conversation, even in terms of planning about when I see my child, I really have to work through that with my kid’s mom. I can’t do that with her, even though she’s a teenager. [4:45] Yeah, even though my kid’s a teenager, it’s inappropriate for me to work through her in terms of even scheduling when I see them. It really does require conscious effort to keep from putting kids in the middle, and I think you’re easily fooled by that. Adrian: [5:09] Yeah. You can kind of rationalize that by saying to yourself, “Well, I’m just trying to find out what’s going on,” or, “It’s just easier this way. I don’t have to deal with my ex,” or whatever. But, yeah, the reality is the kids don’t want to be in the middle. They’re not your little messengers. They don’t want to be trapped, and have to carry that emotional burden of being that conduit. [5:37] I think you’re right on in terms of avoiding doing that. It’s, certainly, not good for the kids, I don’t think. It just puts them in a difficult position, in a position where they could start to manipulate their relationship with you if you’re not careful. [5:58] That leads to another issue, the manipulation that may or may not happen between divorces and separations, and being really aware of how kids can get into that. Have you had much experience with seeing some fringe manipulation, or has that been pretty much on the level? [7:19] I think that’s good. It reminded me early on that there isn’t really anything that I need to talk to her about with respect to her mom. I’ve gotten a lot better about that. It was a little tricky in the beginning. Adrian: [7:39] Yeah. I think the other thing that you have to be watchful of or mindful of, is leaning on your kids emotionally, either sharing too much about what’s going on in the relationship, or just leaning on them for emotional support, and venting, and things like that. That can be a big trouble spot. A little bit before the show you were talking about the importance of manning up. Maybe you can chat about that a little bit. Tom: [8:14] Just having the strength to keep the natural and emotional distance and maintain that, and maintain your positive, forward thinking sensibilities when you are with your kid, I think, is challenging and essential. It may be the hardest part of all of it. [8:38] There’s less of a consensus about how much of a facade that you need to keep up. My sense of it is, in the reading that I’ve done, and in my own experience is that, “Mm, no.” Honestly, you need to man up and keep a pretty solid, and dare I say, almost phony facade up for your kids in the context of your own emotional pain. [9:06] Yeah, you’re hurting, and your family’s been essentially dissolved, but your relationship with your children hasn’t changed. That needs to be very clear in your nonverbal communication as well as your verbal communication. You and I, child, are as great as we’ve ever been. I love you as much as I did the day you were born, and I’m never going to stop loving you. [9:37] Maintaining that continuity of attitude and emotion and engagement with your child is really essential. I think it’s hard as the devil when you’re really trying to navigate all this stuff when it’s new, to maintain that level of positivity, and warmth, and openness, and communicativity, if that’s even a word, when you’re going through that painful transition. Adrian: [10:11] Ultimately what kids are looking for is a sense of safety and security. If their dad is kind of falling apart and an emotional wreck in front of them, I think it’s OK to fall apart and be an emotional wreck with your extended family or your friends or your therapist. [10:27] You really need to put on a good game face in front of the kids to let them know, “You’re safe, you’re going to be taken care of, you’re going to be OK.” They need to be able to trust that. They’re also going to be looking to you as an example, how do you deal with things when things go sideways in life, when things get really rough, how do you handle yourself. [10:51] If you can maintain composure, and you can be strong in the face of this tremendous adversity, that’s a real teachable moment life lessons for your kids. They can see, “OK, how am I going to react? Well, I’m going to look at my dad. I’m going to see how he handles it. I’m going to do what he does, not what he says. If he’s got it together, he’s able to maintain his composure and be able to provide safety and security for me, then I’m going to feel, one, good about myself and where I am, and I know that I’m going to be well taken care of. [11:28] That’s how I will handle things when the bully comes in first grade.” It starts transitioning over. Tom: [11:37] My kid is a little older. I find that she looks to me for some things, and looks to her mom for other things. I was interested in what you said about kids manipulating the situation. [11:52] I think you give them a lot more window to do that if they smell weakness. While we love our kids and we think they’re just the greatest thing ever. That makes it hard to see when they are sort of poking you and testing you particularly younger ones. It’s the case for all ages and all sort of temperaments, but I think different kids probe for weakness at different times particularly depending on the continuity they received from parents when they were young. [12:24] Do you ever find that your kids were kind of poking you for weakness? Adrian: [12:28] Yeah. I think that’s just the nature of kids. They want to test boundaries, they want to see what they can get away with, they kind of can circle around like “little hungry wolves,” sometimes relentlessly poking at things, and trying to get at you. Tom: [13:12] Hey, you got the 25th anniversary of Madden coming up. Adrian: [13:15] As opposed to saying, “OK, I’m going to go get four games and a new bicycle, how’s that? Now who’s better?” Don’t fall into it. It’s tough too to kind of do that, but I think just acknowledging and say, “OK, that’s fine,” but then don’t take it any further than that, and try to just nip it in the bud there. [14:13] It really is critical to kind of avoid that, to do what you’re saying to go. Your mom’s got fun stuff, I got fun stuff. Your mom is going to tell you when to go to bed. I’m going to tell you to do the same thing. [14:29] Your life as it relates to discipline and ritual maybe slightly different from one household to another, but that doesn’t mean that you’re not going to have to do the same things, do the same chores, go through the same rituals, do the same self-care routine in both places. Adrian: [14:51] You actually bring up a good point about establishing routines and rituals. It’s critical to quickly set up some rituals and routines for your kid or kids. That means having breakfast at the same time every day. [15:07] There’s setting up some morning chores like making your bed, brushing your teeth, that type of things. This is what we do when we’re getting ready for school. When they come home, we have the same kind of rituals that we go through, have dinner, when we get ready for bed, the kids brush their teeth, they put their pajamas on, we read a book, and then it’s off to bed. [15:28] I think what that does is that kind of grounds them a little bit. It gives them a sense of this routine that they can kind of lean on that things are OK and things are solid. [15:39] I think it’s really important to build that in there. I believe the sense of being safe and secure is critical for a kid’s emotional well-being. Having those rituals in place where they can kind of depend on them, and they just know what’s going to happen one day to the next at your place in the midst of all this upheaval, and this big change that’s going on gives them some grounding. Tom: [16:07] Yeah, because the tendency would be for guys to be kind of slack about bedtimes, teeth brushing, pajamas, baths, all that kind of stuff. Particularly, if you had a household that was running kind of traditionally, and even if you were co-parenting really aggressively with you partner, then things breakup, and you’re not going through that, you can still have that same routine, and in fact coordinate it. [16:38] As we were discussing earlier, communicating through your child is pretty much off limits. I wish I didn’t say pretty much. I should equivocate it. It hits us off limits I think. At the same time, you still have to communicate with your spouse no matter how contentious things really are. You could still use email to check on those things. [17:02] We’ve talked about this before the value of email in the context of aligning those things and making those rituals consistent. Adrian: [17:14] When it comes to communicating with your spouse, really move towards email, move towards texting, and stay away from the verbal communication, especially early on in the process because every one’s emotionally charged, there can be a lot of contention there, a lot of anger. [17:32] If you’re on the phone or face-to-face things usually tend to escalate quickly, because you both know how to push each other’s buttons. It’s difficult to maintain that on that live type of communication. [17:46] As soon as you can, switch all communications over to email. It’ll give you some time. Just the process of writing it out calms you down, putting your thoughts down on paper, and then delay sending out those emails, especially if it’s a charged issue. [18:21] I definitely recommend using that methodology so that you can kind of slow down your response, make sure that you’re not having a knee-jerk reaction, and make sure that you don’t have accosted kind of things in the email. Because anything that goes in the email, you might as well put it on the front page of the Times. It’s just out there. Tom: [18:39] Never put anything in an email that you wouldn’t want to say in a Senate Subcommittee hearing, right? Adrian: [18:43] Right, there you go. Tom: [18:45] I think that’s right, because when you’re looking at it and you know that it’s permanent, and you know that that email never goes away despite whether you try to erase it. Or even if she agrees to erase it if you’ve wrote something terrible, and you say, “Hey I just sent you an email and I didn’t mean it, delete it or whatever.” Yeah, that’s not going to happen. [19:08] Really having a chance to look at what you’re putting in that email in the cold, rational light of day makes a huge difference preventing things from escalating into places that, honestly, I don’t think either party wants to go. I think it’s only people who benefit from the passion and the yelling and the overstatements are the lawyers. They’re, honestly, they share their own self interest. In the context of more billable hours the better, so the more nuts you get, the better for your attorney and your spouse’s attorneys. [19:50] Keeping things in the email just keeps it so much better, and if you really focused on that with respect and communication, it gives you that outlet that you need, so you don’t have to communicate through your children, which is really the message that we want you to take away from this podcast. [20:10] Your children have their own issues, they have their own challenges. They are worried about school. They are worried about their friends, or they’re worried about their toys, or they’re worried about where they’re going to sleep, and they’re not really worried about mom and dad. You shouldn’t give them any reason to worry about mom and dad, because that’s just going to add to their list of anxieties and it’s going to make things a lot harder as they get older. [20:37] If you are using your kid as an emotional crutch, or you’re using your kid as a communications channel, you’re going to wind up really paying for that, I think. Especially down the road. I think that can really emerge as problematic as much or more than during the time of separation. Adrian: [20:58] Bottom line is that the kids need to be kids. They’re not there to take care of you emotionally, and to raise you, and to watch out for you. That’s not their role or their responsibility, so having that emotional strength and fortitude to, at least in front of them, put forth that strength, and safety, and security that they’re looking for and need. Frankly, it’s good for you too. You’re not supposed to be leaning on your kids for your emotional well-being. Tom: [21:25] That’s right, and that’s a great point, because we’re going to talk about this in another podcast, but, I think it’s the next one if I’m not mistaken, the role of family and friends. That’s what family and friends are for. I think you mentioned that at the top of this podcast. Make sure to put people in the right bucket, in terms of your own emotional support. Kids do not belong in the emotional support bucket. [21:55] It’s really easy for them to get there, because you love them and you want them to be happy, and you want to share things with them. If you have been emotionally honest with your kids in the past about stuff when you’re sad, then the tendency is to want to be emotionally honest with them at a time when you’re super sad, when all this is going down. But it’s like that’s [inaudible 22:21] , and you got to be really careful. If they catch you being sad, it’s like that’s your queue to snap up, right? Adrian: [22:26] Yeah, I think so. It’s that fine line of being like OK I think you can be sad. You can show some of that but curling up in the fetal position and sucking your thumb in the bathtub that might be crossing the line. I’ve been there, man. I’ve been there in those dark moments, but not in front of the kids. Tom: [22:45] No, not in front of the children. Adrian: [22:47] Not in front of the children. [22:49] In terms of strength and fortitude, I think that’s kind of the name of the game. You can look at that as a challenge to yourself. Putting the kids first, I hate that clichCB) but I think it’s important. It’s an emotional kind of test for you, if you want to look at it that way. Tom: [23:05] Yeah, can you maintain your game face for your children in the wake of the most emotionally, tumultuous time in your life? That’s the challenge. That’s the warrior challenge, and a lot of guys benefit from viewing it that way. If you frame that way in your mind and become conscious of that, you can do a much better job at getting your kids through this as unscathed as possible. [23:34] We do the best we can as far as parenting goes, and we all fall short. I think the trick for me has always been to choose my battles, not to try to correct every single thing that my kid does. You said it yourself. Kids don’t do what you say, they do what you do. That’s the most important to consider as your going through this. [24:00] When you’re really looking for strength to keep up what is essentially a faCB’ade, if we’re all going to be honest about it, you’ve got to keep that in mind. You’ve got to show your kids how to keep the stiff upper lip when times are tough. That’s what gives people courage and bravery. [24:20] You know that whole fake it until you make it thing that they talk a lot about, in terms of career and those sorts of things. I think that applies here in terms of success, in terms of success with your children. Fake your happy outlook until you get it and you will get it, right? Adrian: [24:38] Yeah, actually things do settle down. I’m about three years out from my separation and divorce. Yeah, things settle down and they change, and they ultimately get better. What you’re going through now will make you emotionally stronger, but it is a testing ground. It’s a testing ground to see how do you handle it, are you going to really be a man in terms of the emotional fortitude that you need? [25:07] That term, manning up, really has a lot more to do with how you are in terms of your emotional strength, and your emotional character, and the decisions that you make. How much you can bench press or squat. I think that’s an important aspect to keep in mind. What’s it mean to be a man in this type of situation? Tom: [25:30] Yeah, being emotionally strong, and really putting forth that attitude and that assumption that this is all going to be fine. We’re going to be different, but we’re going to be fine. That’s that. It doesn’t have to be more complicated than that. [25:47] The challenge is when you view your spouse doing crazy or inappropriate things, not to be critical of them in front of the kids, dealing with it in the email as dispassionately as possible. No matter how angry you are, no matter how frustrated you are. You are benefitted by taking your anger away and taking it out. [26:08] If you really view your divorce as war, and you’re really taking it on that way, first of all, you got to recognize that your kids are noncombatants. Second of all, you have to be really smart about not acting out of anger. Dig all the way into auto war and see how important it is to remain dispassionate about this whole thing. When you find yourself driven by your emotions, a little bell should go off in your head that this is not going to work out optimally for me. I need to figure out what to do when I don’t take into account my emotions. When I put my emotions on the side lines, and then what is the action that I need to take. [26:54] That is something that we can all sort of agree that’s the masculine, or the male sensibility applied to what is very female-centered process. I’m sure a lot of people would take issue on that, but the biased is the kids need to be with their mom and her culture. We can complain about it and rail against it, but the reality is, the reality of it is that we need to deal with that, and move past our emotional response to it and just deal with it as rationally as possible. Keep the kids out. [27:34] Good talk Adrian, I think that we have kind of covered the main points we wanted to discuss about kids. What’s on the agenda for our next podcast? Adrian: [27:44] OK. Next time we’re going to be talking about friends and family, and how your divorce can heal some wounds in your immediate family. As well as how you can lean on your friends and how they can possibly help you through this difficult transition. Tom: [27:59] Yeah, just how we were talking about how kids have no role in your emotional support, your family and friends are there to provide that emotional support. [28:11] That’s where you really need to go when you’re lonely, and angry, and frustrated, and disgusted, and all of those negative emotions that you’ve bottled up and squished down to maintain your composure in front of your children. Your family and your friends are really there to help you do that. We’ll talk about some of the disappointments that you’re likely to face when you first reach out, but some of the amazing things that are out there that you have no clue about, that you’ll tap into that will really brighten your life and make it a whole lot better. [28:52] Until then, I’m Tom. Adrian: [28:53] And I’m Adrian. Tom: [28:54] Thanks for listening to us. Announcer: [28:56] Thanks for listening to the overdivorce.com podcast, with Adrian and Tom. The opinions expressed are their own, they’re not professionals. Join us next time anyway. It will be good for you. 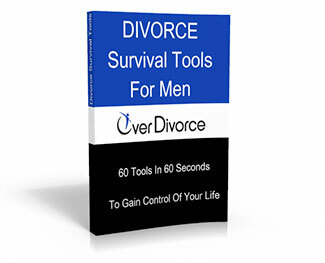 Visit overdivorce.com to get your free divorce recovery guide, and get some fantastic resources on making a better life. 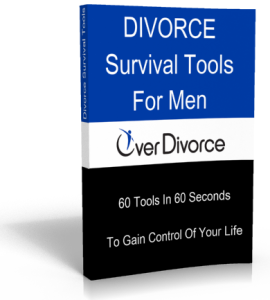 [29:15] Contact us via email at podcast@overdivorce.com. Follow us on Twitter, and like us on our Facebook page. We want to help you, if we can.